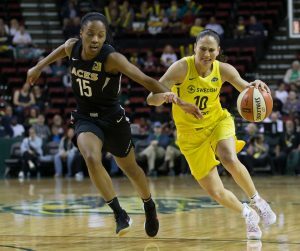 Sue Bird works past the Aces’s Lindsay Allen. Bird scored 11 points and dished out nine assists during the game. Neil Enns/Storm Photos. For every three-pointer made by a Storm player, one tree is planted in the Mountains to Sound Greenway, a 1.5 million acre landscape that stretches from Seattle to Central Washington. Thursday’s contribution alone could at least qualify as a thicket, if not the beginnings a small forest all its own. Seattle drained a league-record 17 shots from behind the arc en route to a 101-74 blowout of the Aces at the Key. 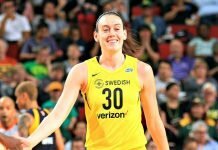 Breanna Stewart and Las Vegas rookie A’ja Wilson led all scorers, and their respective teams, with 21 points each, while Jewell Loyd finished with 20 in Seattle’s fifth-straight win. 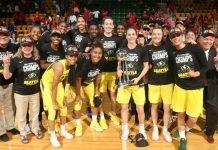 “In this league every now and then you get to play a game like that, and every now and then you are on the other side as well, but for us today it is a culmination of how well we have been playing,” said Sue Bird, who had 11 points and nine assists in a season-low 19 minutes. 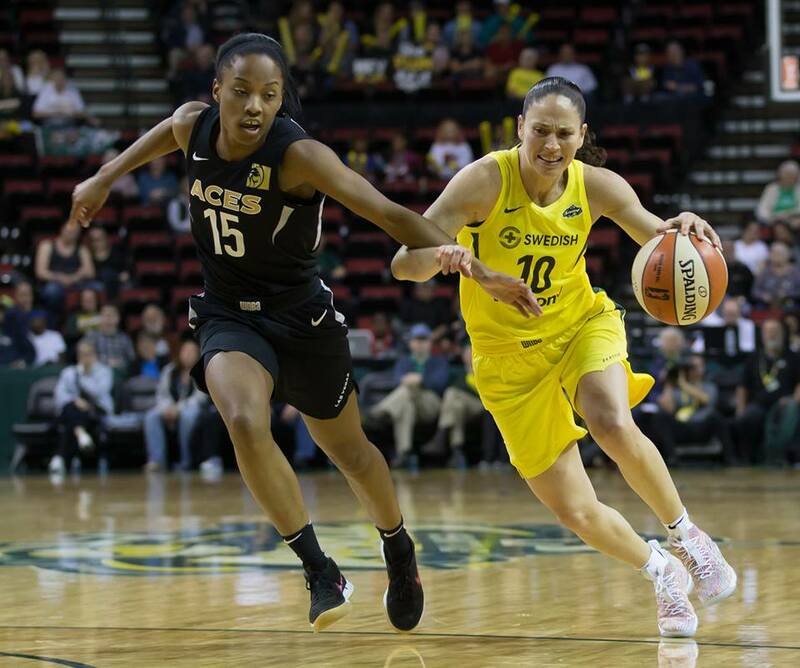 It was Loyd who set the tempo early for the Storm offense — with a team-record-tying 17 points in the first quarter — as Seattle started the night 10-of-12 from the field and 5-of-6 from three-point range en route to a 38-14 lead after 10 minutes. That gap continued to grow from there, with Seattle taking a 28-point advantage into halftime, and held a 36-point lead after three quarters. Meanwhile, the threes kept on falling. A Kaleena Mosqueda-Lewis triple with time winding down in the third broke the single-game franchise record, with a Sami Whitcomb three setting the new WNBA record with 7:45 to play. At that point, Seattle was 17-of-23 from three-point range, an eye-popping 74 percent from distance. The team missed its final three three-point attempts. With the result well in hand, the Storm was held scoreless for the final six-plus minutes of the game, as Las Vegas finished the night on a 16-0 run. 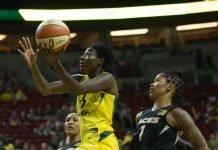 Despite that late push, Seattle’s early cushion allowed head coach Dan Hughes to turn to his bench for significant playing time, with all five starters logging season lows and none playing more than 24 minutes. And to that end, the reserves stepped up. Mosqueda-Lewis tied a season-high with 13 points, Jordin Canada finished with nine and an early career-high seven assists, and newcomer Mercedes Russell — making her Storm debut after signing with the team earlier in the week — had a game-high eight rebounds. When asked whether his team was capable of shooting as effectively as it did on Thursday more often, Storm head coach Dan Hughes demurred, but acknowledged that its a strength. The Aces are the youngest team in the league, and coach Bill Laimbeer said that was the difference in the game. Seattle finishes a stretch of six games in 12 days on Saturday in Dallas, while the Aces return home Friday to face the Mystics. Seattle is now 2-0 against Las Vegas, after spoiling the Aces’ home opener 105-98 this past Sunday. 19-year-old JiSu Park made her first career start for Las Vegas. The rookie from South Korea is the team’s youngest player. Rookie center Russell made her Storm debut, after being signed on Wednesday. The second round pick (No. 22 overall) by New York finished with two points, eight rebounds, and a pair of blocks in 17 minutes of play. With her 483rd career appearance, Bird moved to No. 3 on the WNBA all-time games played list.